With apologies for my carbon footprint, I recently returned from a working tour of eight cities Down Under. The trip included an invitation to Melbourne to work with the staff of the city’s successful new public space development, Federation Square, and to help lead a Placemaking training course that included many city staff, local developers and "place managers." In the process, I had the opportunity to learn a few things relevant to my hometown, New York City. 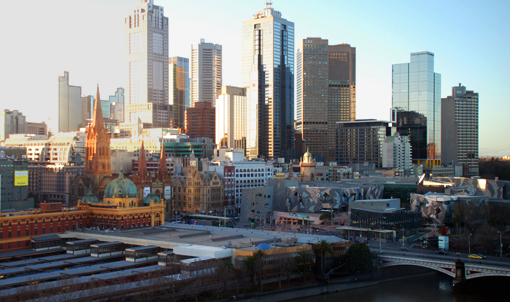 Melbourne’s central business district is as dense and urban as any U.S. city other than New York. Like New York City, Melbourne—the fastest growing city in Australia, with a population of nearly 4 million—has a lively public life. But it hasn’t always been so. A “New World” city, designed on a grid, Melbourne went as far, or further, than its U.S. counterparts in planning itself around the automobile. In 1993, Jan Gehl, who happens to be in New York City this week to start work with Department of Transportation, ran one of his “public spaces, public life” surveys in Melbourne. During that first Melbourne study Gehl collected baseline data on how public spaces were being used and made recommendations for improvements. He worked with the city to implement some of these improvements and in 2004 Gehl’s team was invited back to do a second study. They found that dramatic changes had taken place during the decade between the studies. Street space in Melbourne’s central business district has been taken away from private automobiles and reallocated to transit riders and pedestrians. A page from Gehl’s report shows a grading of the degree to which ground floor uses support public life during the two study periods. 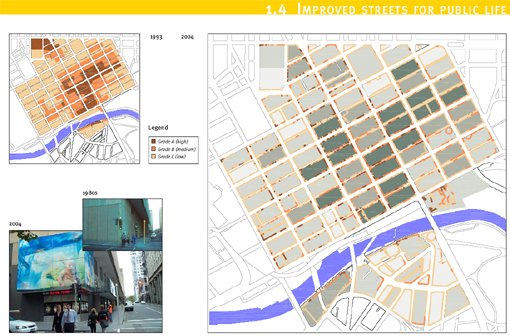 In addition to documenting the increase in sidewalk space and decrease in cars, Gehl’s studies tracked the steady improvements of ground floor retail spaces in central Melbourne. These improvements contributed significantly to the city’s increasing pedestrian friendliness and the revitalization of downtown. 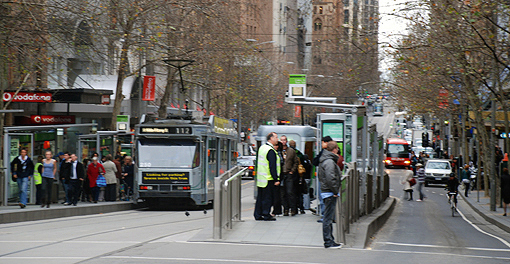 Reallocation of street space away from private automobiles and public investment in transit has provided direct benefits to retail businesses in central Melbourne. Efforts to reduce the cost of traveling by transit from the suburbs to the city center combined with the rising cost of gasoline has led to a rise in transit ridership that has greatly surpassed expectations. As in Jan Gehl’s Copenhagen, Melbourne has steadily eliminated on-street parking space.Today, there is very little on-street parking and virtually zero free parking in the central business district. In the beginning of 2006, Melbourne instituted a new parking levy on all long-stay private/commercial parking spaces in the central business district, starting at $400/space and moving to $800/space. The revenue generated from this levy, estimated at $38.5 million in fiscal year 2006-07, is being reinvested in transportation improvements including a free shuttle in the central business district. Completed in 2002, Federation Square is Melbourne’s most prominent public realm improvement and the greatest testament to the city’s commitment to fostering public life. 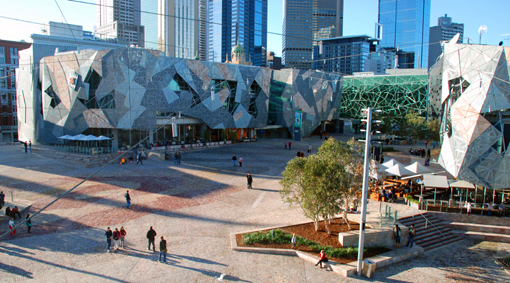 Built over a rail yard, Federation Square is the city’s living room, cultural center and nighttime destination. It took a huge public investment of around AU$473 million (just under US$400 Million) to do the project. For comparison, Chicago’s Millennium Park, which is a similar size new public space and also built over rail yards, was built for $475 million around the same time. Despite initial community resistance, the Square has been embraced by the city and is generating significant returns on many fronts. My work with Federation Square included facilitating a public space audit to help them look at how to continue to improve and manage the space, engage new partners and audiences, and create a broader sense of public ownership and participation. In many of the newly reclaimed areas in Melbourne these same issues were very relevant. Bourke Street Mall was transformed into a pedestrian street in the late 70s and then reconfigured recently as a transit mall. It is also one of the Melbourne’s defining public space destinations. However, participants in my Placemaking training course gave the new streetscape poor marks. Just as the street was once dominated by automobiles, many now feel that the new transit-oriented design is still oriented too much around transportation and not enough around shopping, cultural creativity and social life. 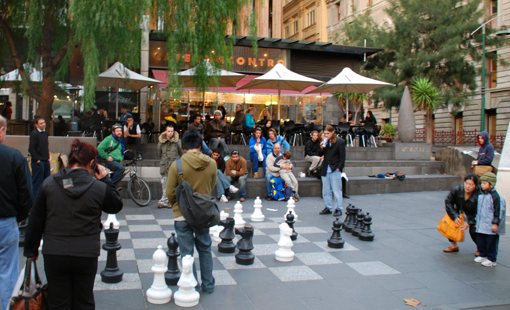 In the middle of one of the busiest sidewalks in Melbourne, people take time to stop and play chess, watch chess or just watch people. As the title of Gehl’s report suggests, it is the "places for people" that are making Melbourne work and are bringing about its dramatic shift. It is these destinations that, despite greater difficulty in accessing via the private automobile, are bringing people downtown, getting them to stay longer and driving further investment. At first glance, one might assume that the successful revitalization of Melbourne’s downtown was the result of the city’s efforts to drive automobiles out of the central business district. But traffic reduction was only one piece of the puzzle. Melbourne’s renaissance was accomplished by focusing on the improvement, democratization and vitality of the city’s public spaces. Lots of great stuff here, but is New York City really suffering from a lack of destinations that people want to walk and take transit too? New York City is plenty vital. So vital that people are stuffed into the subways and buses, new buildings are mushrooming on every corner and sidewalks are overflowing. It’s dense and getting denser. Yeah our public spaces need work, but let’s get some basics out of the way — like widening sidewalks all over the place. It’s ped-lock! Ray H – I agree, we need to widen sidewalks asap and do everything possible to improve travel for pedestrians. However, New York’s public spaces are in dire need of attention. Penn Station and the surrounding area is hostile to the elderly and handicapped, foreboding to new visitors, and doesn’t feel remotely like a civic space for the public. Same goes for 125th St, Times Sq, Herald Sq, Houston St, much of Coney Island, Queensboro Plaza, and of course Atlantic Yards — just to name a few. New York has some great public places — Central Park, Washington Sq Park, St Mark’s Place, Park Slope — but they tend to be parks or upper-middle class neighborhoods. One interesting thing about Melbourne and other urban areas in Australia is that per capita they consume more energy and waste more water than rural areas. Why this is so, is still a mystery to me, and I don’t even know if New York has the same relationship with its suburbs (in terms of energy usage). Regardless, it is something that we do not want to emulate. One of the major impacts that I think Jan Gehl’s London study (as well as probably the Melbourne one), accomplished was to show that just because people are walking in London does not mean they are happy walking. The study suggested this through its finding that pedestrian volumes in the winter were similar to the summer. This point, along with others in the report, effectively challenged the myth of success for London’s streets and public spaces and set London boldly on its current course. A couple examples of how PPS has tried to address the issue of overcrowding in NYC… We were brought in to study and make recommendations for Rockefeller Center in the 80s when they started having trouble with crowds and then in the last year to work in a similar way with Times Square. In both instances, while more sidewalk space was desperately needed and recommended, a big part of the answer, as well as the best strategy for getting more space, was actually creating more “places for people”, more comfortable, flexible, sitable destinations. Rock Center had been and Times Square still is designed and managed to move people (and cars) through them and less as destinations. Creating a range of destinations that manage and define the pedestrian experience more positively for a broader cross-section of users, distributed it more widely in the district, was the strategy here. The big opportunity in NYC is not just to make these major destinations work, but as you guys and Jan Gehl point out is to widen sidewalks. And this can perhaps best be accomplished if we start to evaluate, plan and manage our streets not just corridors for mobility, but as places for people. It definitely appeared that Australian cities have made all of the great mistakes that we have in terms of their ecological impact. However, I was struck by how open to being self critical people were. Everyone I met as well as national media seemed to be very comfortable talking about issues of “Carbon Footprint”, global climate change and even placemaking. My general sense was that while they may have made many of the same mistakes as us they were much more open to and motivated to change… and are quickly going to leave us in the dust! Ethan – thanks for the report, this is fascinating. New Yorkers really need to get on the ball and look imaginatively to the future. Melbourne and Toronto have extensive grids of street railways in addition to subways and commuter rail lines. In NY, vision42 — IRUM’s proposal for an auto-free light rail boulevard for 42nd Street — could serve as a model for an extensive grid of light rail lines, many set in auto-free streets in Manhattan, and elsewhere in NYC. Surface rail transit makes a big difference in the attractiveness of dense places. Melbourne’s higher carbon output per capita is mostly due to the antiquated coal power stations that are still used. The CBD is quite pleasant, but dear god…the train services are terrible. The train tracks spread out in all directions, so that to get to any place not on your train line, you have to travel to the city to change lines. Also, how does 1 train per 20mins on my line sound? Are those trams any good inside the city? My guess is he meant by traveling to “the city,” he means the CBD. When I lived in Sydney, that’s what we called it. 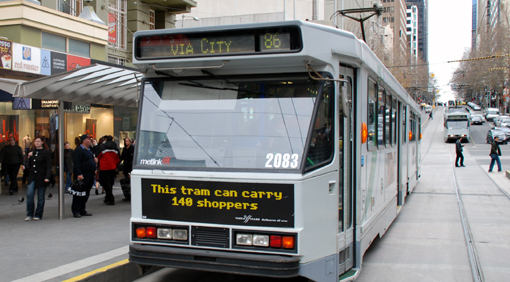 Melbourne is an amazing city, and I thought tram service was quite good. With that said, I stayed in Carlton North I believe, which wasn’t too far from the CBD. Of all the cities in the world I’ve visited, Sydney and Melbourne are my favs for some reason. New York would fall in my top 5-10. Melbourne also has fantastic Asian cuisine in its CBD. Really great report. I can see that Melbourne has changed quite a bit since I was last there in 2002. Just to comment on something a few blogs ago ….. why per capita do the inner city areas of Australian cities consume more water and energy than the suburbs? It is a great report which investigates the habits of the people in our Australian cities. When you boil it down, the reason behind the high use of energy and water is related to individual income. Inner city areas in Australia have a much higher income per capita than the suburbs. With high income comes high disposible income. High disposible income results in more restaurant dinners, another pair of jeans, more trips abroad, a new couch, a larger house, etc, etc. Therefore the habits of the population need to be tackled if we in Australia are going to reduce our carbon footprint. I attended the ICTC conference in Auckland and can’t find your presentation on the ICTC website. I am Town Centre Manager of a suburban centre 8Km from the CBD. I’d like to quote your comments in the presentation on building communities around public spaces (we have four attractive landscaped public courtyards)rather than around roads and cars. Can you please e-mail me your presentation or notes? Hope you can help. “Melbourne” Most Livable City? in the World ….. p’tum. soy chileno y estuve 3 mese allá, fue una experiencia hermosa, es una muy linda ciudad. Y posee muchos atractivos turísticos de gran interés. Su gente es amable y si te manejas algo con el inglés no tendrás problemas en desenvolverte. Streetfilms Shorties: Why Don’t We Plant Trees in the Road?